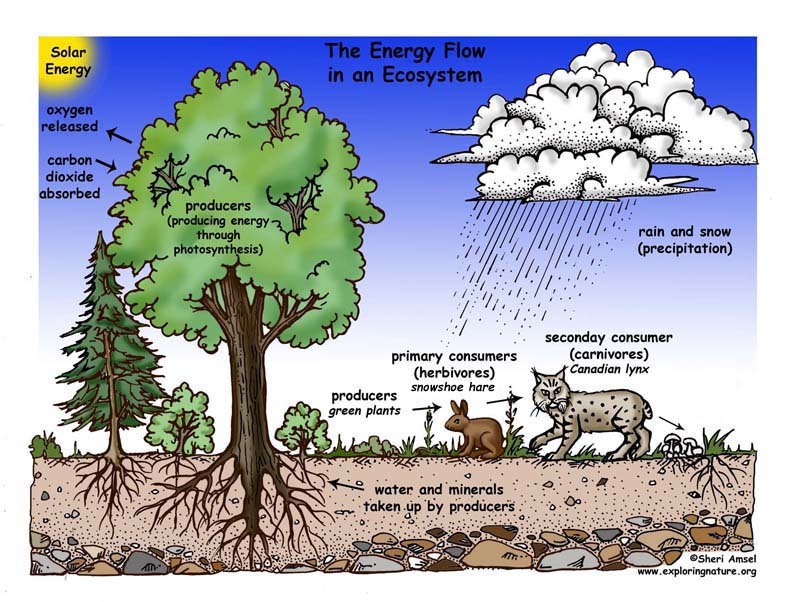 Ecosystems are made up of living things (biotic) like plants, animals and tiny bacterium (microorganisms) and non-living things (abiotic) like rocks, water, air and sunlight. 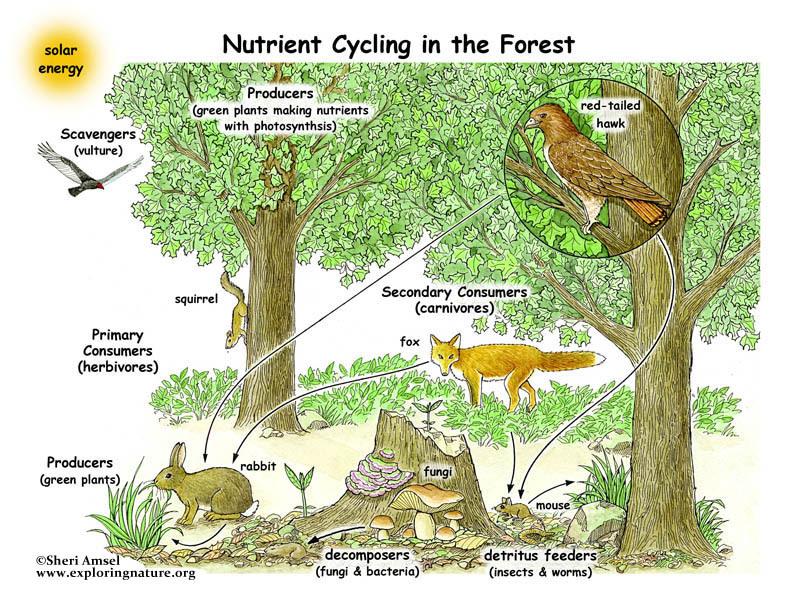 An ecosystem needs a balance of living and nonliving things. With enough sunlight, warm temperatures and water, plants will grow. Plants also need soil nutrients to grow. Many plants have even adapted to shade, very little water and cold temperatures. Plants growing in an ecosystem, in turn, support animal life. Plants are called producers because they produce the energy in an ecosystem with sunlight driven photosynthesis. Then they pass their energy on to the animals that eat them. The animals are eaten by other animals and pass the energy on once again. 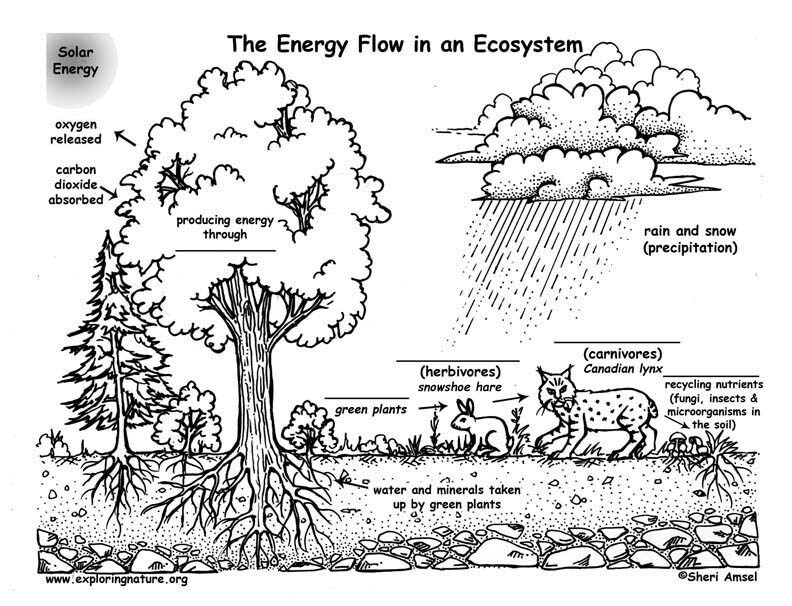 Energy flows through an ecosystem as one animal eats another animal or plant. This is called a food chain and shows “who eats who” in an ecosystem. For example: Leaves provide food for a caterpillar, which is eaten by a song bird, which is then eaten by a falcon. 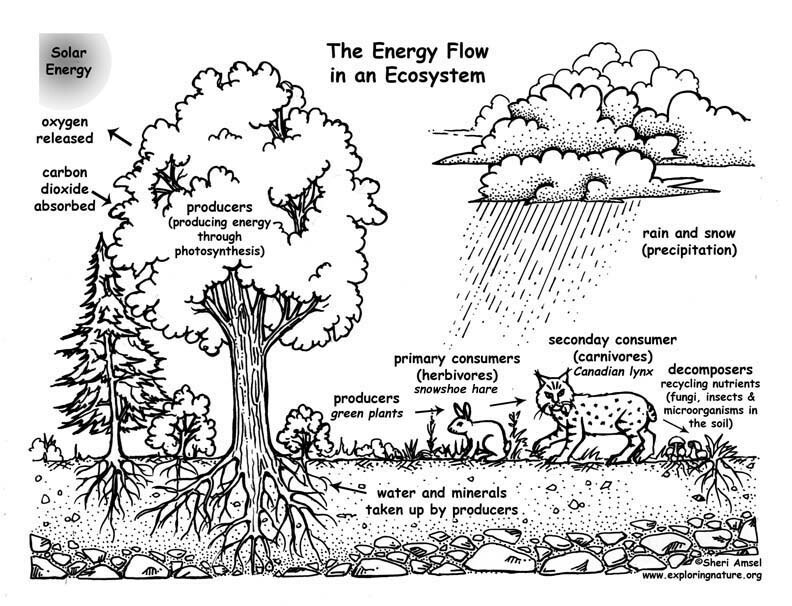 The energy flows through the food chain from plant to animal to animal. Each part of the food chain has a name. Plants make (produce) their own food using water, sunlight and carbon dioxide (photosynthesis). There are more plants than any other living thing because they are the bottom of the food chain and provide the energy for everything else. With each exchange, some energy is lost as heat. So there must be many more plants at the bottom of the food chain to support the animals on the top. Plants are the PRODUCERS or AUTOTROPHS (self-feeders). 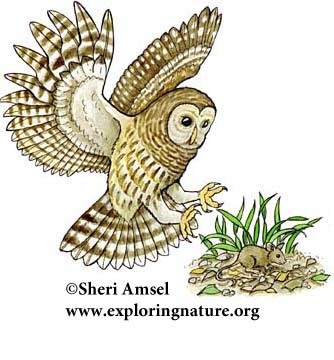 The animals (insects, mice, chipmunks, squirrels, rabbits, deer) that mostly eat plants are called the herbivores. There are fewer herbivores than there are plants because each herbivore needs a lot of plant matter to live and, as they eat plants, some energy is lost to heat. Herbivores feed directly on the producers. Herbivores are the PRIMARY CONSUMERS. Animals (spiders, birds, snakes) who eat other animals are the SECONDARY CONSUMERS. There are fewer secondary consumers than there are primary consumers because each secondary consumers needs to eat a lot of primary consumers to live. Animals (fox, coyotes, eagles, owls) who eat the 1st & 2nd consumers are carnivores (meat eaters). They are the TERTIARY CONSUMERS. There are fewer tertiary consumers than there are secondary consumers because each tertiary consumers needs to eat a lot of secondary consumers to live. Because there are fewer animals as you move up the food chain, it is really a food pyramid with the big carnivores needing to eat the most and so being the rarest of the animal kingdom. Because animals really eat many things, the food chain has many overlapping parts, so is really a FOOD WEB. Last but not least, the DECOMPOSERS (fungi and bacteria) or DETRITUS FEEDERS (insects) feed on dead animals and plants releasing their nutrients back into the soil. Nothing is wasted in an ecosystem.